The National Rifle Association launched its new series, “Love at First Shot,” last week at its Annual Meetings in Indianapolis. We are delighted to announce that our good friend, Natalie Foster, of Girls Guide to Guns, is the host of this series aimed at dispelling myths about shooting and making the world of shooting a more hospitable place for women who want to participate. Smith & Wesson, a firearms manufacturer that is so in tune with the women’s market, sponsors the series. 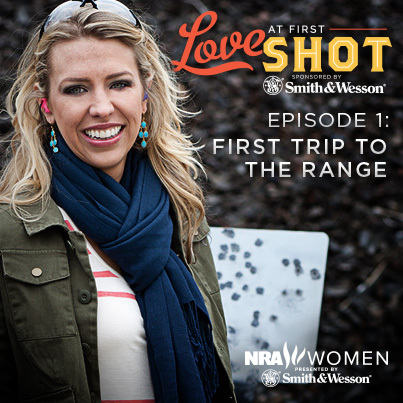 Episode 1 features “First Trip to the Range.” Natalie explains how to make that first trip to a shooting range with confidence. Often, that first trip can be an intimidating thought. Where to go? How to dress? What to expect? Trust Natalie to take you there, and also, to talk to industry experts, like Julie Golob, on how to plan ahead so that the experience is memorable in a good way. In fact, you can see the episode right here. The WON applauds the efforts of the NRA in its endeavors to invite women to join the front ranks of an organization fighting for our 2A freedoms.